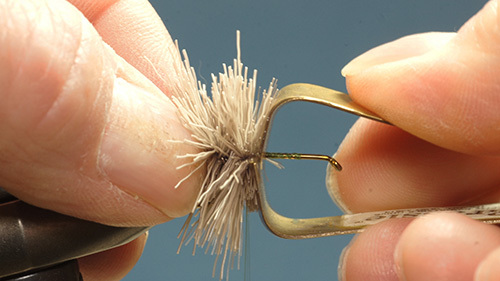 1) Cover the rear ¾’s of the hook shank with tying thread. Keeping the front quarter of the shank bare provides a proportional goal post to ensure enough room remains, after forming the body, to build the head. Trim a pencil diameter sized clump of deer hair from the hide. Remove the underfur and short fibers. Trim the tips of the prepared deer hair clump. Lay the prepared and trimmed clump across the shank on a 45 degree angle. Place two loose controlled wraps of thread around the deer hair. As you make the third wrap begin increasing thread pressure. As the hair begins to flare release the deer hair so it spins around the shank. 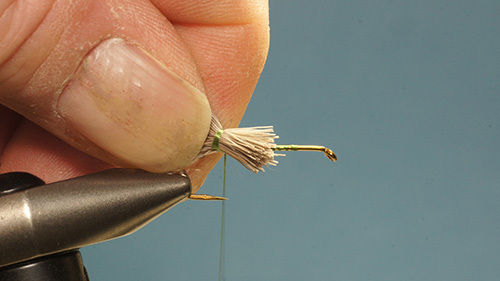 Continue winding the tying thread in approximately the same spot through the deer hair as it spins around the shank. Once the deer hair stops spinning add a few more wraps for added security. 2) Prepare a second clump of deer body hair. Spin it onto the shank in front of the first clump. 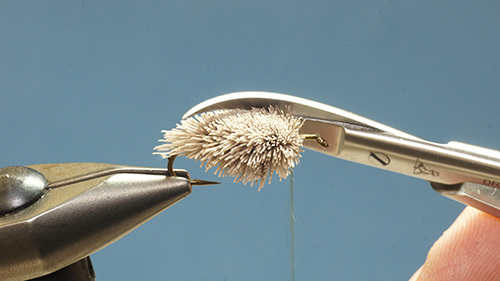 Once the second clump is secure use your thumb and forefinger or a hair packer to push and pack the two clumps together. Support the rear of the first clump so you don’t accidently push the deer hair back out of position. 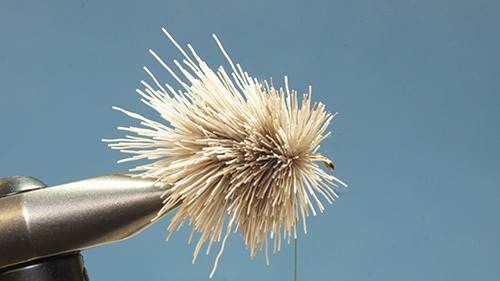 A tight well packed body provides buoyancy keeping the fly off the bottom reducing the risk of snagging or fouling. 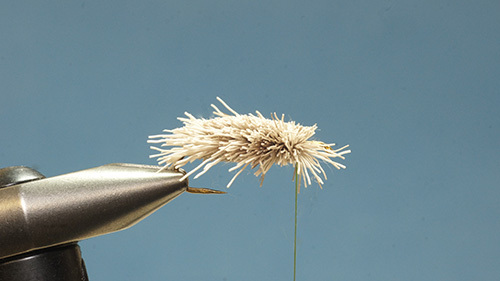 3) Continue forming the body by spinning pencil diameter sized clumps of deer hair onto the hook until the rear three quarters of the shank is covered. 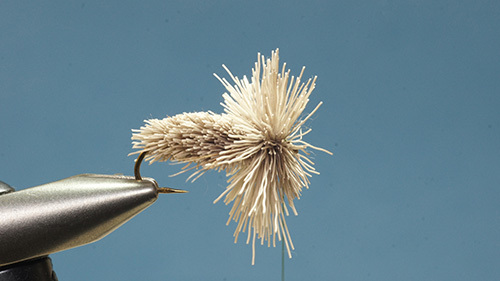 Remember to pack the spun deer body hair tight together after each clump to form a dense buoyant body. 4) Trim the body flush, both the top and bottom. 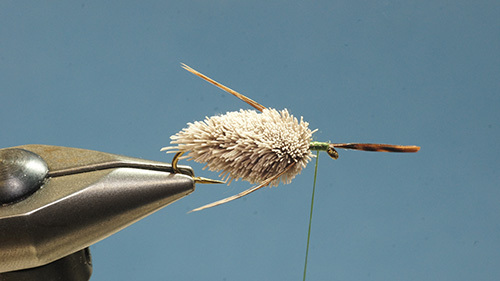 Make sure the hook gap is unobstructed by the body so the finished fly can successfully hook fish. Body trimming can be done either in or out of the vice. 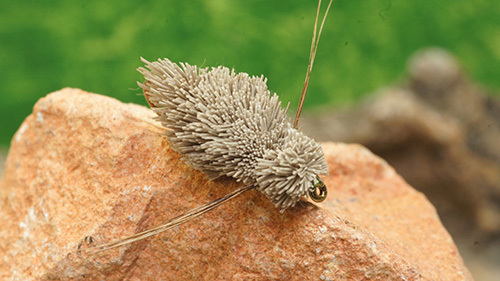 5) Shape the body by trimming the sides to a curved shape, mimicking the natural profile of a Sprawler nymph. Curved scissors are an asset when shaping the body. 6) Tie in two sets of legs, six to eight fibres per set, just in front of the body so they trail down the sides, tips even with the end of the body. 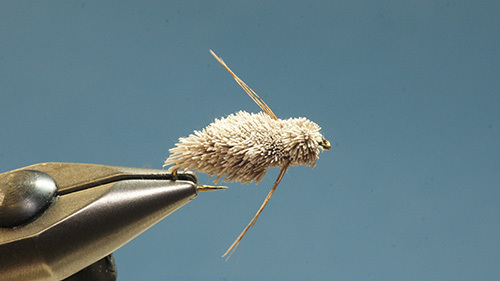 7) Form the head by spinning one to two clumps of deer hair, as space allows, over the front quarter of the shank. Push and pack the hair back tight against the body and legs. Build a neat head whip finish and apply head cement. 8) As with the body, trim the head flush top and bottom. Trim the sides so the head is somewhat square across the front and angles back to the body in a somewhat triangular shape similar to the natural nymph. Use care when trimming to avoid accidently removing some or all of the legs.